If you start building your layout, it is recommended to add row/column element in order to create a structure of your page. The most common way to add an element to your layout is by using the Add Element menu, available via the Navigation bar. The element will be added at the very bottom of your layout. Note: It is not mandatory to add row/column container (unless you want to set a number of columns in advance) as Visual Composer Website Builder will automatically wrap newly added content element into row/column. 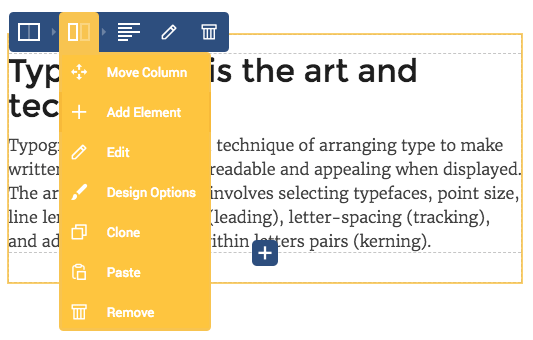 At the very bottom of your layout, you will see a bottom menu that allows you to quickly add most popular row/column layouts (from 1 to 5 equal columns), set custom row/column layout, text block or open Add Element window. Select an element from the Add Element window. If your column is empty and does not contain any content elements, you will see Add Element icon as a placeholder inside your empty column. To add an element to the empty column, click on the add element icon inside the column and select the element from the Add Element window. 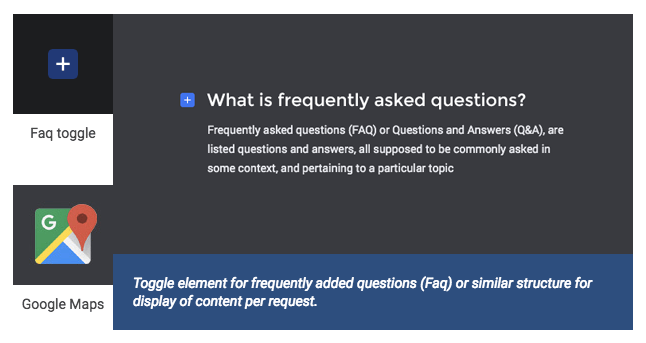 To insert content element in-between other content elements, use the bottom control that will show up on element hover. Select the element of your choice.